What makes the World's best granola? Exciting flavors begin with the best ingredients. Organic whole foods are nutrient-dense and contain no pesky herbicides, pesticides or genetically modified ingredients. Savor the flavor of each organic grain, fruit, nut and seed in our granolas. You’re not only treating your body to usable calories that sustain you throughout the day, you are supporting a network of growers committed to agricultural biodiversity and ecological harmony. The health benefits of olive oil are unrivaled. Whether acting to protect against coronary disease, fighting inflammation or providing antioxidants to the immune system, olive oil is naturally high in healthy fatty acids that benefit the heart and the mind. We select a mild organic EVO oil with fruity, buttery notes to complement the nuts, fruits and chocolate in our granolas. It is also essential to the delicate texture of our finished products. We believe that a minimal amount of organic maple syrup or honey satisfies our urge for a sweet treat. With 5-10 g of sugar per half-cup serving and a dusting of sea salt, we strive for balanced flavors and don't stop until our recipes deliver that elusive "wow" factor. Go ahead and splurge! We initially asked ourselves the question, "Who took all of the "good stuff" out of granola?" Paltry, overly-sweet and one-dimensional granolas lined grocery shelves. Our mission was simple: Make the world's best granola! Bursting with organic nuts, seeds, fruits and grains, we like to say our granolas are the marriage of a premium trail mix and golden toasty oats and quinoa. Each ingredient explodes with vitamins, minerals, protein and fiber. As a breakfast cereal, light dessert or between meal snack, you're sure to enjoy our unique gluten-free combinations! One of my favorite chef buddies says "It takes a village." It does. We do not do this alone. The many hands it takes to bring our ideas to life are essential and revered. Relationships are the key to building a strong business foundation with measured growth. There is strength in numbers. As a chef, I have been using Askinosie Chocolate for years and believe it’s unmatched for flavor and quality. Our Kick Start granola develops an other-worldly dimension with the addition of Askinosie natural cocoa powder. Shawn Askinosie, award-winning chocolatier and owner of Askinosie Chocolate in Springfield, MO, believes that direct trade pays off. Visit askinosiechocolate.com to learn about the many ways his company gives back to the communities it touches. Scott Carey, owner of Sump Coffee in St. Louis, MO draws the best shot of espresso west of the Mississippi. His ability to coax at once subtle, and then bold flavors out of each roasted bean is masterful. Taste his artistry in our Kick Start granola! Organic Missouri pecans are a featured ingredient in our The Original granola. Smaller in size and oil-rich, these little gems are bursting with flavor! We choose only the best organic fruits for you! The way Mother Nature intended - plump, tart and plentiful in each serving. 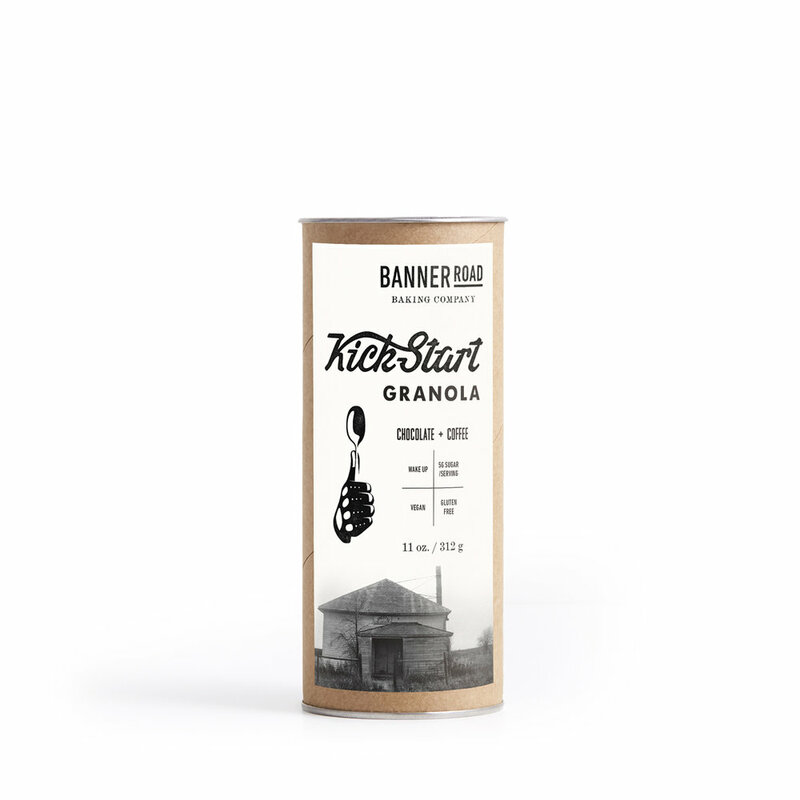 Inspired by the fading grain silos of rural Midwestern farms, Chef Anne zeroed in on a recyclable composite tube to package our granola.. We felt that it would stand out from the many pouches on grocers shelves as well as protect our much coveted clumps and clusters in shipping. Our 4 ounce Grab & Go containers are easily tossed in a purse or backpack. The 14 oz tube makes a perfect holiday, hostess or teachers gift. Put a bow and trailing ribbons on top and you're ready to impress! I owe a great debt of gratitude to the many amazing chefs I've worked with. They are too many to name and you know who you are. Curiosity is key. As an artist, cooking is the medium I'm most comfortable with. An endless array of flavors, ingredients, textures and impressions await us everyday in our small kitchen. Thank you for the opportunity to nourish you. Your many messages and emails make our work meaningful. Building a company that thrives on a foundation of ethical and sustainable business practices is critical to us. Awareness and constant education is key to that process. Our team maintains an ongoing dialog around vendor integrity, ingredient selection, safety, waste and recycling. We are an inclusive, employee-focused company and support the living wage initiative. In 2018 we received Organic Certification and Non-GMO Verification on all of our products. Our long term goal is to join the many certified B Corporations.